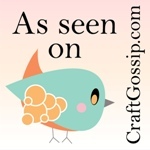 I have been seriously dilatory with blog posting lately. In my defense, however, I had the heaviest teaching load ever this past term, and this left little time for meaningful sewing. I have managed to get a few things done, however. This weekend, I finished up a simple little quilt top that is going to be finished up for my daughter's new BFF at university, Samantha. Sam saw the quilt that I made for my daughter and flipped over it. Eve says Sam is always petting it when she comes into Eve's room. I had started this project when I wanted some quick, mindless chain piecing, and it seemed perfect for a young woman's residence room. So Sam will be getting this when it's finished up. If I'm lucky, I can finish it over the holiday and Eve can take it back with her when she goes back to Montreal in January. Being so busy at work, I was often pooped when I got home, and wanted nothing more than to watch some mindless television and do some hand work. 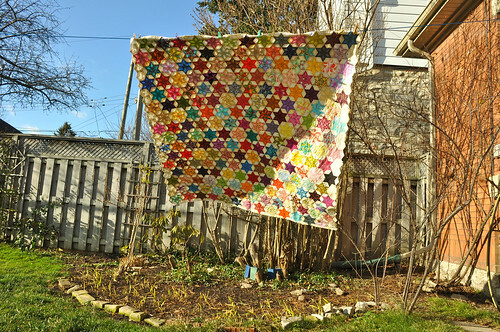 As a result, I'm happy to report that I finished up the quilt top for this hand-piecing project. 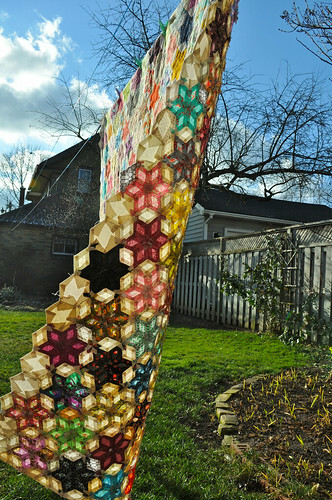 It's made using the English paper-piecing approach (although I used the plastic Quilt Patis templates). I started it in August 2010. I thought about putting a border on this, but I'm not sure about it. I'm thinking I should just stick a binding on it. What do you think? 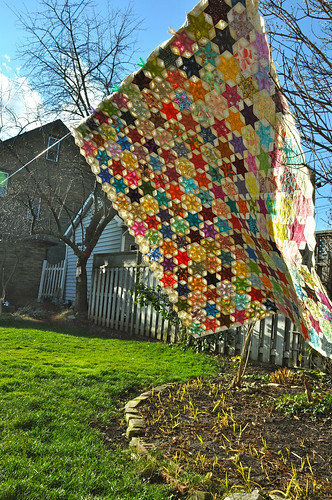 I sure do love the photos of quilt tops taken from the "wrong" side. To borrow from popular song canon, how can it be wrong when it seems so right? I love both of your quilts! Gorgeous use of color and the patterns are really fun. 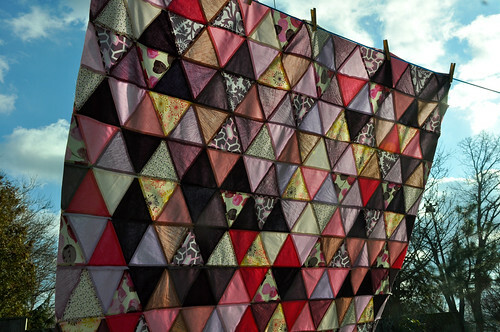 Wow, the triangle quilt is lovely and the stars are amazing!! And the back picture does look wonderful. I look forward to seeing these quilted. 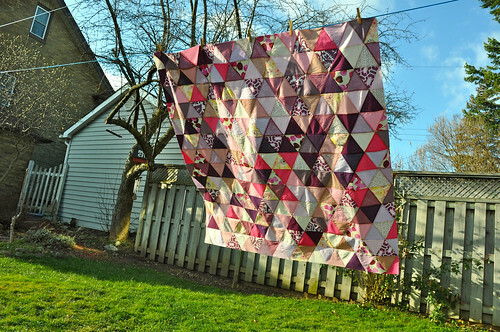 oh my goodness - just LOVE your pics of your quilts!! They are both beautiful! Won't Sam be thrilled!? SO nice of you. And RE: the borders on the 'star' quit - I'd just trim that baby & bind 'er up! Ooooh - I love those stars, they're gorgeous! 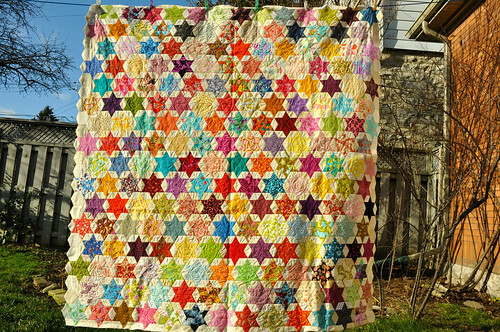 I love both the quilt tops but am positively drooling over the star one. And no, it doesn't need a border. It is perfection the way it is now. They're beautiful....I don't think a border is needed either. Both are gorgeous! Love them! Gorgeous!! I adore your star quilt...what an accomplishment. I would be tempted to edge it with a narrow strip of the background colour, to let the stunning stars shine, and to give a little distance between the binding and the stars themselves. But I think I'm in the minority here :) It will be an absolute stunner no matter what. 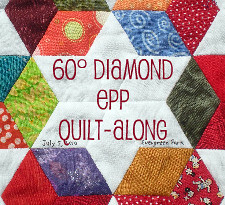 thank you for the eye candy~ i love your pictures of quilts, so much that I almost want to send you my quilts just to photograph them on your closeline..
congrats on both finishes. I think if just adding binging to the EPP will get it done, then do it. i have two completed epp portions, just waiting for borders which may or may not ever happen. don't follow my example there! Wow!! Both quilt tops are gorgeous!! 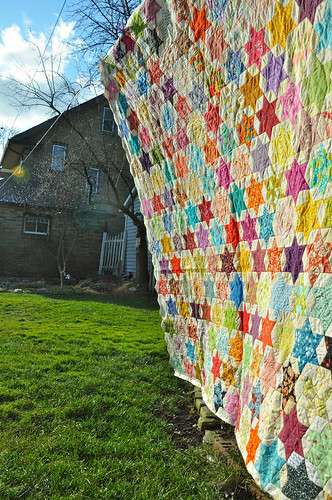 I especially love the star quilt!! Amazing work!!! Wow! Two beautiful quilt tops! 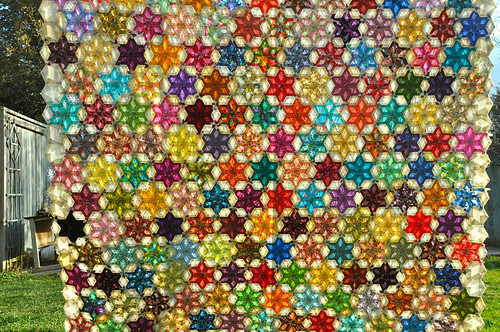 The starquilt whith only binding is my opinion! Your pictures are very much inspiration to me!! 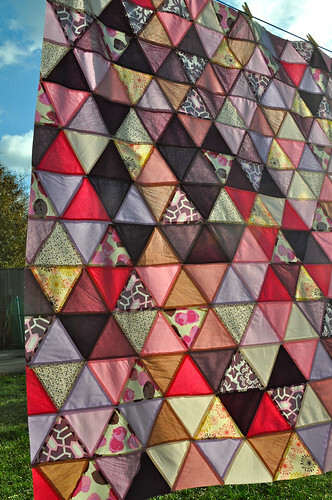 Both of those quilts are gorgeous! What a lucky girl your daughter's friend is! 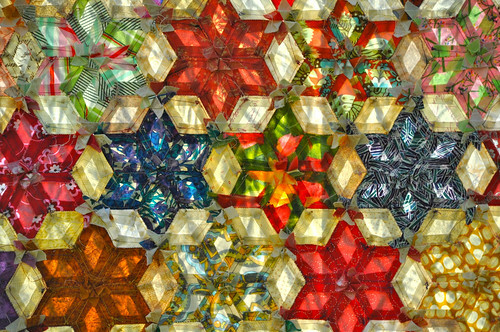 The paper-pieced stars are so beautiful. Wow! You make me want to run to my sewing machine right now. wow, lesly. what is the size of that finished diamond top? it truly is beautiful and i think a border just might ruin it. 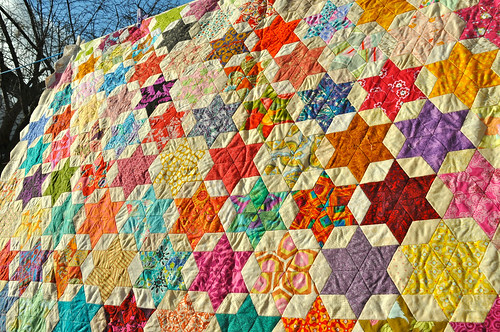 bind it as is, unless you absolutely need more quilt. 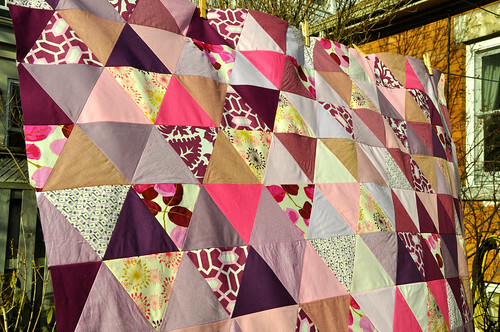 eve's friend will be tickled to get that quilt-- it's so cute! Those are both so lovely! Your do such wonderful work! I love both quilts. I'd go no border, but that's me.